One of the easiest and hardiest orchids that you can grow in your garden. Bletilla, or the Hyacinth Orchid, is one of the hardiest and easiest to grow terrestrial garden orchids in the UK. Slowly forming clumps which produce their gorgeous detailed, striped violet-pink flowers in early summer. It is quite unfussy when grown in light shade - so it can be grown in the ground under trees, in lawns, or even in patio pots as long as they are shaded from direct sun. An easy to grow plant, which if left undisturbed, will naturalise and spread out to form good-sized clumps. Supplied as an established plant in a 9cm pot, ready for planting out or potting on. Plants can reach 50cm high and 50cm wide. Orchids are one of the most popular plants in the UK and when you see their exotic blooms, it's easy to see why. The ones that we are used to seeing are houseplants and need to be grown inside - however there is a hardy orchid that you can grow in your own garden! Bletilla, or the Hyacinth Orchid, is one of the hardiest and easiest to grow garden orchids in the UK, slowly forming clumps which produce their gorgeously detailed violet-pink flowers in early summer. 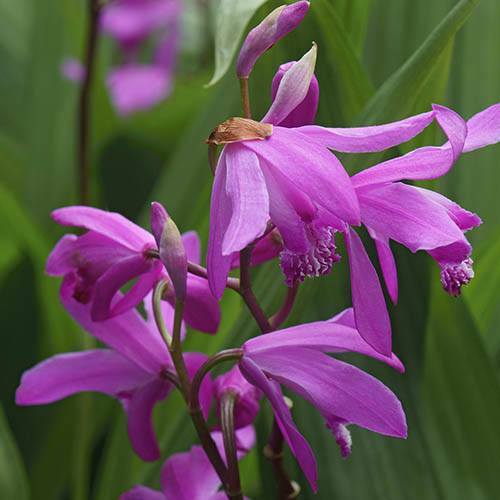 When grown in light, dappled shade, bletilla is quite unfussy so it can be grown in the ground under trees, in lawns, or even in patio pots (in shade). B. striata forms a clump of attractive, ribbed, sword-shaped leaves, with erect stems bearing many violet, fragrant, orchid-shaped flowers in spring and early summer. Blooms can reach up to 5cm wide, and each has a ruffled lip in a slightly darker shade, making them a stunning addition to your garden. Although hardy to -10, we recommend growing them in a container where they can be moved to a conservatory or unheated greenhouse during winter, and in mild areas a generous layer of dry mulch should be applied in autumn to provide protection for the corms. Alternatively, lift the corms in autumn and store it in a dry, frost-free place. One thing you need to remember is that bletilla should be kept dry during their winter dormancy, as they will not survive cold, wet soil. Supplied as an established plant in a 9cm pot, ready for potting on or planting out when the soil warms, plants can reach 50cm high and 50cm wide. NB - Plants are dormant October to March so there may be no leaves on your plant when delivered. Under glass, grow in a soil-based potting compost (for example JI No.2) with humus, in bright light, out of direct sunlight. In summer water freely, applying a quarter strength balanced liquid fertiliser at every third watering. Keep dry in winter. Outside, plant in dappled shade in well-drained soil that is rich in organic matter. If necessadry, incorporate some horticultural grit to open up the soil. Mulch with dry bark or bracken over winter.